Background: Autism spectrum disorder (ASD) is a neurodevelopmental disorder characterized by impairment in social interactions, communication, restricted, and repetitive behaviors. Evidence-based treatment options for ASD are limited. Yoga is practiced by over 20 million people worldwide, and multiple studies have investigated yoga as a possible effective intervention for children with ASD. Aim: The aim of this study is to investigate the effect of yoga intervention on short-term heart rate variability (HRV) in children with ASD. Methodology: In this study, 50 children (38 boys and 12 girls) with ASD were recruited from Swabhimaan Trust, Palavakkam, Chennai. They were randomly grouped into ASD with yoga intervention group (n = 25) and ASD without yoga intervention group (n = 25) by simple lottery method. Yoga group children underwent yoga training for 3 months, and the control group did not receive any such training. For short-term HRV, 15 min electrocardiogram recording in sitting posture was recorded in lead II using a simple analog amplifier. Results: In HRV, time domain parameters such as mean RR interval (0.72 [0.74] to 0.94 [0.92]), standard deviation of the NN intervals (52.04 [54.23] to 74.48 [72.80]), and root of the mean squared differences of successive NN interval (32.60 [34.40] to 40.83 [42.90]) significantly increased in ASD children after yoga intervention. In frequency-domain parameters, high frequency (HF) in n. u (48.08 [47.24] to 58.37 [59.22]) shows a significant increase and low frequency (LF) in n. u (52.4 [51.82] to 40.51 [40.12]), and LF/HF ratio (1.29 [1.31] to 0.78 [0.79]) shows a significant decrease in ASD with yoga intervention group children after 3 months of yoga training. Conclusion: Yoga interventions have been successful in bringing parasympathetic dominance in ASD children, and the greater advantage is being a noninvasive way of intervention to support children with ASD and help them to achieve physiological as well as psychological balance. Autism spectrum disorder (ASD) is a broad range of conditions characterized by impairment in social interactions, communication, restricted, and repetitive behaviors, affecting 1 in 150 and it is five times as common as Down syndrome. Autistic characteristics are generally first recognized in early childhood. ASD presents with symptoms suggestive of autonomic nervous system (ANS) dysfunction. ANS dysfunction is reported as a feature of ASD and is also associated with atypicality in the amygdala, the anterior cingulate cortex, and the insula – the brain structures that play a key role in modulation of the ANS response. Intact ANS function is linked to behavior, cognition, and emotion processing, and indices of its function have been associated with different domains which are affected in ASD such as social behavior, emotion regulation, concentration, response inhibition, and adaptive functioning. Heart rate variability (HRV) is a good indicator of autonomic function related to cardiovascular health and has been studied in a range of situations and conditions to determine the variables that influence it. Different methods are available for the analysis of HRV. According to the European Society of Cardiology and the North American Society of Pacing and Electrophysiology, time and frequency domains together with the Poincaré plot are the most widely used methods in the complex field of nonlinear methods. Time domain parameter of mean RR interval (standard deviation of the NN [SDNN] intervals also reflect overall status of HRV), root of the mean squared differences of successive NN interval (RMSSD), and pNN50 represent the activity of the parasympathetic nervous system. The low-frequency (LF) band of the HRV is mainly related to sympathetic modulation when expressed in normalized units, and efferent vagal activity is a major contributor to the high-frequency (HF) band. The LF/HF ratio is correlated with sympathovagal balance. Treatment strategy for ASD is often unclear as to who exactly should “treat” and how they should be “treated.” Yoga has successfully been used as an intervention for attention deficit disorder/attention deficit, hyperactivity disorder, and depressive disorders. For children with ASD, for whom a more competitive physical exercise is frustration, Yoga has the advantage of being noncompetitive and providing an optimal environment. Yoga is an ancient system of lifestyle having a psychosomatic-spiritual discipline that helps to achieve a harmony between our mind, body, and soul. Application and practice of yoga have shown a decrease in sympathetic activity and increase in parasympathetic activity bringing a shift in the autonomic balance toward the parasympathetic dominance indicating a reduction in stress in young children. Yogasanas such as Ardha Chakrasana (half wheel position) and Trikonasana (triangular position) by stimulating the vestibular and proprioceptive systems appear to have positive and significant therapeutic effect on the child's self-confidence by increasing coordination and courage and also encouraging appropriate risk-taking behaviors. Yoga intervention has an added benefit by toning and decreasing the hyperactivity by calming the nervous system. Other benefits of practicing yoga by adolescents with ASD to decrease the stress and address sensory processing difficulties and also brings improvements in respiratory and cardiovascular function. A common intervention used to combat anxiety behavior in individuals with ASD is by medications. However, this could present minor to serious side effects. Hence, parents seek complementary and alternative medicines (CAMs) for their children with ASD. Surveys have estimated that over half of children with ASD use CAMs and therapies. In a study of the current trends of parents who use CAM therapies, it concluded that 30% of parents utilized mind–body interventions. According to 2007, National Health Interview Survey states that yoga, a mind–body intervention, is one of the top ten methods used as CAM. 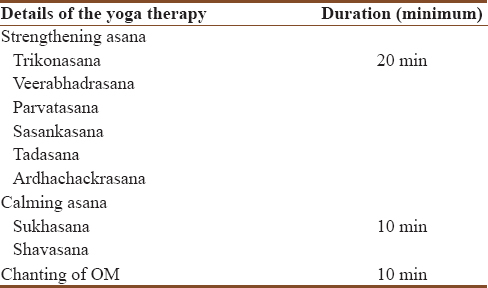 Approach and utilization of CAM therapies and yoga are on the increase among the children with ASD which warrants the exploration of yoga for adolescents with ASD. With these issues in mind, the goal of the present study was to investigate the effects of the yoga intervention on short-term HRV in children with ASD. In this study, 50 high-functioning ASD children (38 boys and 12 girls) with full-scale IQs >80 assessed using the Wechsler Intelligence Scale for children were the participants. All the children were under the age group of 8–14 years (age – 9.56 ± 2.40). Ethical clearance was obtained from the host institution, and informed consent from the parents was obtained before the initiation of the study after explaining the details of the intervention. Children with organic disease or regular antiepileptic drugs were excluded from the study. 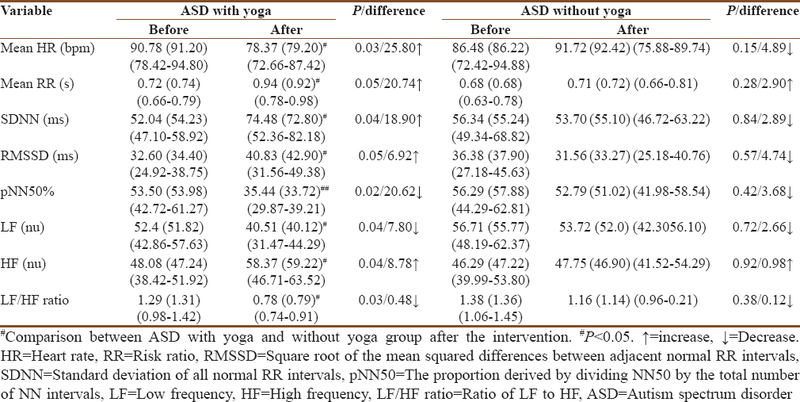 After the recruitment in the study, they were grouped into ASD with yoga intervention (n = 25) and ASD without yoga intervention group (n = 25) by simple lottery method. ASD with yoga intervention group children underwent yoga training along with their routine for 3 months and ASD without yoga intervention group continued only rehabilitation therapy (vocal, language, and other occupational training in the special school). We have recorded the activity of the cardiac autonomic modulation by short-term HRV before and after yoga therapy. Anthropometry assessment was done before the commencement of the intervention. For short-term HRV analysis, 15 min electrocardiogram (ECG) recording in sitting posture was recorded in lead II using a simple analog amplifier. For the recording of short-term HRV, the recommendation of the task force on HRV was followed. ECG recording was done in the morning after light breakfast (10.00 am to 11.00 am), and children were allowed to urinate before starting the recording, which could otherwise alter their autonomic status. After that entire 15 min recorded, ECG signals were manually checked for missed beats or other artifacts if found was removed. RR interval data from the ECG recording were imported into Kubios software for HRV analysis in offline. Thus, HRV data were excluded when recordings have >10% of premature beats or artifact time exceeded 5% of the recorded time. Linear model HRV analysis was carried out in this study and analyzed in the time and frequency domain. In the time domain, the SDNN interval, the square RMSSDs, the number of interval differences of successive NN intervals >50 ms (NN50), and the proportion derived by dividing NN50 by the total number of NN intervals (pNN50) were used. In the frequency domain, power spectral density analysis in nonparametric method (fast Fourier Transform) was used. They were LF (0.04–0.15 Hz) and HF (0.15–0.40 Hz) in square milliseconds (ms2) as well as normalized units (LF nu and HF nu, respectively) and LF/HF ratio. After HRV recording in children, they were subjected to Yoga therapy for 3 months under the supervision of yoga therapists. A minimum of 40 min Yoga intervention was given to the autism children every day in the morning. Details of the therapy are given in [Table 1]. During the entire course of the period, all the children were assisted by a trained therapist for the proper yoga practice. OM chanting was done with audio aids since they have practical difficulties to chant OM properly. We avoided pranayama practice, but at the same time, deep breathing was taught between every practice. Fifteen ASD participants of 25 enrolled in the ASD with yoga group completed entire yoga therapy sessions [Figure 1]. Five participants (all boys) completed only 2 weeks of sessions and dropped out of the study due to family circumstances. Five students were excluded from the data analysis because three of them (two boys and one girl) involved in another kind of therapy (reflexology and acupressure) and two of them (both boys) had more artifacts in their ECG recordings. In control group, five children were dropped out because three of them have not turned up for the second time of HRV recording and two recordings were with full of artifacts (>10% of recording). Data expressed as mean (median) and range. Wilcoxon signed-rank test and Mann–Whitney U-test were used to compare the mean difference within the group and between groups using R statistical software version 3.1.1. Methodology for participants' recruitments and detailed intervention with their inclusion and exclusion in the study is clearly depicted in [Figure 1]. Participants' characteristics are presented in [Table 2]. No statistically significant differences were observed between groups at the baseline level. Short-term HRV parameters are presented in [Table 3]. There is a significant reduction in mean HR (90.78 (91.20) to 78.37 (79.20)) in the ASD children after yoga intervention. Time domain parameters such as mean RR (0.72 (0.74) to 0.94 (0.92)), SDNN (52.04 (54.23) to 74.48 (72.80)), and RMSSD (32.60 (34.40) to 40.83 (42.90)) significantly increased in ASD with yoga intervention as well as when compared with ASD without yoga intervention group children. In frequency-domain parameters, HF in n. u (48.08 (47.24) to 58.37 (59.22)) shows significant increase and LF in n. u (52.4 (51.82) to 40.51 (40.12)) and LF/HF ratio (1.29 (1.31) to 0.78 (0.79)) shows a significant decrease in ASD with yoga intervention group children after 3 months of yoga training. To the best of our knowledge, this is the first study to assess the effects of yoga therapy as an intervention on short-term HRV for children with autism. Since the ASD children had mild autonomic dysfunction, we have found the constructive response in the form of time and frequency-domain parameters in HRV after 3 months of yoga training. The short-term power spectral analysis of HRV signal has been used to assess autonomic control of heart rate, and autonomic dysfunction has been associated with an increased risk of mortality in randomly selected general populations. Several types of autonomic dysfunctions have been reported in autism, including increased basal sympathetic tone as well as reduced baseline parasympathetic activity in association with increased baseline sympathetic tone., Ming et al., 2011 reported that there is reduced baseline parasympathetic activity and increased sympathetic tone in children with ASD which is similar to that of our baseline findings. Another study where respiratory sinus arrhythmia (RSA) was used as a measure of cardiac vagal tone compared to RSA values between children with and without ASD and found that children with ASD had significantly lower RSA values and faster HR than those without ASD, suggesting decreased vagal cardiac regulation in children diagnosed with ASD. Decreased RSA has been associated with difficulties in social behavior, decreased language abilities, internalizing symptoms, and cognitive delay. In agreement with these above statements, our results showed significant improvement as observed by increased mean RR, SDNN, RMSSD, and HF (n. u) which is an index of parasympathetic activity and decreased LF (n. u) as an index of sympathetic activity, after Yoga intervention in autistic children. These findings after yoga intervention in autism children clearly explain the significant increase in parasympathetic dominance and a decrease in sympathetic activity. It has been well reported in earlier studies that yoga practice will help to bring about a balance and optimization of autonomic functions., Reduced HRV, specifically the attenuated power of HF component, is an indicator of limited psychophysiological flexibility, and low parasympathetic activity could explain the reason for chronic sensory hyperarousal state in children with ASD., This Yoga module as a therapeutic intervention has been successful in bringing parasympathetic dominance in normal individuals, and the greater advantage was being a noninvasive way of intervention to support children with ASD and help them to achieve physiological as well as psychological balance. Yoga should be used as an important therapeutic intervention along with the other rehabilitation techniques because yoga is not only for the body but also to control the mind, behavior, attitude, perception, and memory. 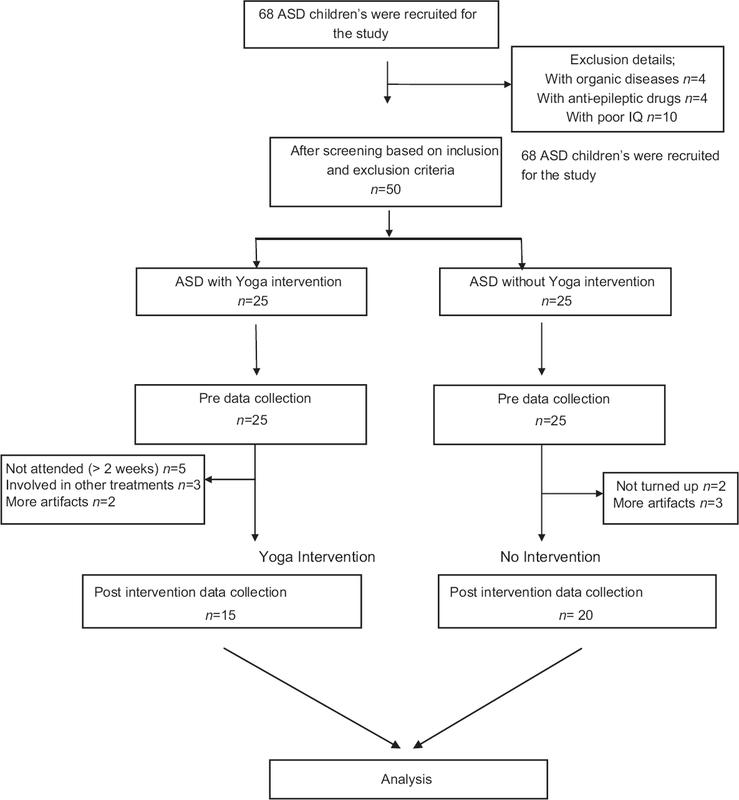 However, there are limited studies done on the impact of yoga therapy in children with ASD, and although it shows significant changes, better trials are required to confirm the positive impact. Kogan MD, Blumberg SJ, Schieve LA, Boyle CA, Perrin JM, Ghandour RM, et al. Prevalence of parent-reported diagnosis of autism spectrum disorder among children in the US, 2007. Pediatrics 2009;124:1395-403. Schumann CM, Barnes CC, Lord C, Courchesne E. Amygdala enlargement in toddlers with autism related to severity of social and communication impairments. Biol Psychiatry 2009;66:942-9. Heart rate variability: Standards of measurement, physiological interpretation and clinical use. Task force of the European Society of Cardiology and the North American Society of Pacing and Electrophysiology. Circulation 1996;93:1043-65. Malliani A, Pagani M, Lombardi F, Cerutti S. Cardiovascular neural regulation explored in the frequency domain. Circulation 1991;84:482-92. Kenny M. Integrated movement therapy™: Yoga-based therapy as a viable and effective intervention for autism spectrum and related disorders. Int J Yoga Ther 2002;12:71-9. Woo MA, Stevenson WG, Moser DK, Trelease RB, Harper RM. Patterns of beat-to-beat heart rate variability in advanced heart failure. Am Heart J 1992;123:704-10. Patil SG, Mullur LM, Khodnapur JP, Dhanakshirur GB, Aithala MR. Effect of yoga on short-term heart rate variability measure as a stress index in subjunior cyclists: A pilot study. Indian J Physiol Pharmacol 2013;57:153-8. Hardy ST. Asanas for Autism and Special Needs: Yoga to Help Children with Their Emotions, Self-Regulation and Body Awareness. London and Philadelphia: Jessica Kingsley Publishers; 2014. Woodyard C. Exploring the therapeutic effects of yoga and its ability to increase quality of life. Int J Yoga 2011;4:49-54. Reaven JA, Blakeley-Smith A, Nichols S, Dasari M, Flanigan E, Hepburn S. Cognitive-behavioral group treatment for anxiety symptoms in children with high-functioning autism spectrum disorders a pilot study. Focus Autism Other Dev Disabl 2009;24:27-37. Hanson E, Kalish LA, Bunce E, Curtis C, McDaniel S, Ware J, et al. Use of complementary and alternative medicine among children diagnosed with autism spectrum disorder. J Autism Dev Disord 2007;37:628-36. Golnik AE, Ireland M. Complementary alternative medicine for children with autism: A physician survey. J Autism Dev Disord 2009;39:996-1005. Maheshkumar K, Dilara K, Maruthy KN, Sundareswaren L. Validation of PC-based sound card with biopac for digitalization of ECG recording in short-term HRV analysis. N Am J Med Sci 2016;8:307-11. Bauer A, Malik M, Schmidt G, Barthel P, Bonnemeier H, Cygankiewicz I, et al. Heart rate turbulence: Standards of measurement, physiological interpretation, and clinical use: International society for holter and noninvasive electrophysiology consensus. J Am Coll Cardiol 2008;52:1353-65. Hirstein W, Iversen P, Ramachandran VS. Autonomic responses of autistic children to people and objects. Proc Biol Sci 2001;268:1883-8. Toichi M, Kubota Y, Murai T, Kamio Y, Sakihama M, Toriuchi T, et al. The influence of psychotic states on the autonomic nervous system in schizophrenia. Int J Psychophysiol 1999;31:147-54. Ming X, Bain JM, Smith D, Brimacombe M, Gold von-Simson G, Axelrod FB, et al. Assessing autonomic dysfunction symptoms in children: A pilot study. J Child Neurol 2011;26:420-7. Julu PO, Kerr AM, Apartopoulos F, Al-Rawas S, Engerström IW, Engerström L, et al. Characterisation of breathing and associated central autonomic dysfunction in the rett disorder. Arch Dis Child 2001;85:29-37. Bal E, Harden E, Lamb D, Van Hecke AV, Denver JW, Porges SW, et al. Emotion recognition in children with autism spectrum disorders: Relations to eye gaze and autonomic state. J Autism Dev Disord 2010;40:358-70. Kuppusamy M, Kamaldeen D, Pitani R, Amaldas J. Immediate effects of Bhramari pranayama on resting cardiovascular parameters in healthy adolescents. J Clin Diagn Res 2016;10:CC17-9. Vempati RP, Telles S. Yoga-based guided relaxation reduces sympathetic activity judged from baseline levels. Psychol Rep 2002;90:487-94. Casanova MF, Hensley MK, Sokhadze EM, El-Baz AS, Wang Y, Li X, et al. Effects of weekly low-frequency rTMS on autonomic measures in children with autism spectrum disorder. Front Hum Neurosci 2014;8:851.